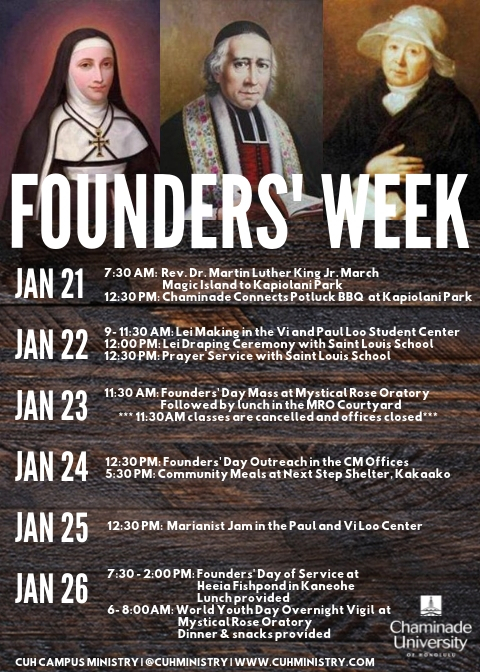 Founders’ Week is a celebration of the three founders of the Marianist Family, namely, Father Chaminade, Mother Adèle, and Marie Thérèse. The week-long celebration will include moments of fun, prayer, opportunities to come together in fellowship, and a time to give back to our community in service. May our blessed founders continue to inspire our Chaminade community to be messengers of hope and beacons of peace to each other and to society. The Marianists are a religious family made of Catholic brothers, priests, sisters and committed lay people around the world. All Marianists look to Mary, the mother of Jesus, as the model of discipleship. They share in her mission of bringing the message of Jesus to the world. The Marianist Brothers and Priests, commonly known as the Society of Mary, founded Chaminade University in 1955.